Healthy eating is not about strict nutrition philosophies, staying unrealistically thin, or depriving yourself of the foods you love. Rather, it's about feeling great, having more energy, and keeping yourself as healthy as possible. As the saying goes "Truth alone wins", it's mostly the kind of food that makes the person you are. • Eat enough calories but not too many. • Eat a wide variety of foods especially vegetables and fruits. • Keep portions moderate, especially high-calorie foods. • Don't be the food police, you can enjoy your favorite sweets and fried foods in moderation. • An excellent way to add healthy sweetness to your meals is by using sweet vegetables like sweet potatoes or yams that reduce your cravings for other sweets. Let's make a conscious effort to give up the unhealthy eating pattern. • Do not rush through your meals. Take time to chew your food slowly, savoring every bite... Reconnect with the joy of eating. • Avoid stress while eating. Try taking some deep breaths prior to beginning your meal, or light candles and play soothing music to create a relaxing atmosphere. • Listen to your body; ask yourself if you are really hungry. It actually takes a few minutes for your brain to tell your body that it has had enough food, so eat slowly. • Start your day with a healthy breakfast to jumpstart your metabolism. 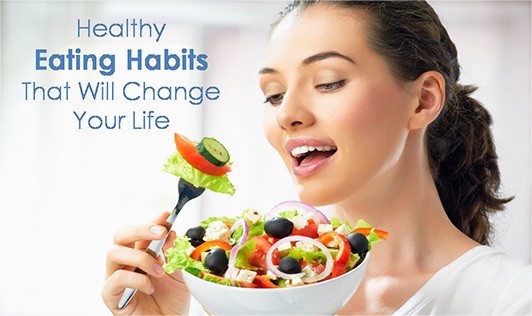 Also, eating small, healthy meals throughout the day can help you ward off snack attacks. Life is not merely to be alive but to be healthy and wealthy. A Spanish proverb says "A man who is too busy to take care of his health is like a mechanic too busy to take care of his tools". Health and Wealth decide the quality of life we lead. If you want to lead a happy life, wealth and health are both important.